Join Bishop Harvey & the Louisiana Conference for this exciting 10-day tour to the Holy Land visiting sites from the Sea of Galilee area to Jerusalem including Jericho, the Dead Sea, Shepherds' Field, Cana, the Church of the Fish and Loaves, Nazareth and more! Add one of the three optional tours to enhance your journey. See the brochure for more information. Pricing starts at $2,998* from New Orleans, $3,298* from Baton Rouge and $3,298* from Lafayette, Shreveport or Monroe. The tour departs on January 21, 2020. Visit Qasr el Yehud, the traditional site of the baptism of Jesus by John the Baptist. Stop in Jericho, the oldest known inhabited city in the world. Visit the ruins of the ancient city, which was conquered by Joshua (Joshua 6:1,2,20) and see parts of the ancient city walls which have been uncovered. From Jericho you can see the traditional site of the Temptation of Jesus (Matthew 4: 1‐11) and the Judean wilderness. Visit Qumran, site of the Dead Sea Scroll discovery, to discuss the mysterious community of Essenes who once lived on the shores of the Dead Sea. Stop briefly at the Shores of the Dead Sea for a quick dip in the salt and mineral‐laden waters. Overnight in Bethlehem. In Bethlehem, visit the cave revered as Jesus’ birthplace and see the Church of the Nativity constructed over the site (Matthew 1:18‐ 25). Gaze out over Shepherds’ Field, explore Bethlehem Bible College and meet Christians who descend from the first century and who are the living embodiment of our heritage in the land today Visit Hope Secondary School and hear a presentation of their ministry. Overnight in Bethlehem. Optional dinner in Christian homes in Bethlehem area (additional $25). Today you’ll make your way from the shores of the Mediterranean to the shore of the Sea of Galilee. Start your day at Caesarea Maritima, the coastal city built by Herod the Great. Explore the extensive ruins including the massive theater and aqueduct. Stand atop Mount Carmel where Elijah called down fire from heaven to defeat the prophets of ba’al. Visit Tel Megiddo, a remarkable site where the remains of 20 cities lie superimposed over one another. Overnight in Tiberias. Explore the Church of the Fish and the Loaves at Tabgha, traditional site of the feeding of the 5,000 (Luke 9:10‐17). On the Mount of Beatitudes, contemplate the “Sermon on the Mount” (Matthew 5‐7). Visit Capernaum, center of Jesus’ ministry in the Galilee, and visit the synagogue built on the site where Jesus taught (Matthew 4:13, 23). 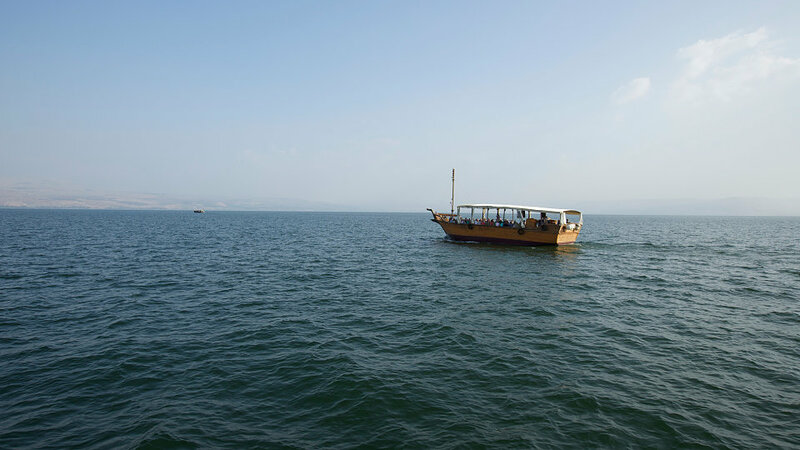 Cross the waters of the Sea of Galilee on a very special boat ride, complete with an onboard worship service. Overnight in Tiberias. Visit the Franciscan Wedding Chapel in Cana, site of Jesus’ first miracle, before continuing on to Nazareth, Jesus’ boyhood home (Matthew 2:23). Continue past Tel Dothan, thought to be the place where Joseph found his brothers with their flocks (Genesis 37). Visit Samaria, the capital of the Northern Kingdom and home to Ahab and Jezebel. See Mount Ebal and Mount Gerizim where the Israelites recited the blessings and curses of the Law. In modern day Nablus (ancient Shechem), see where the Samaritan woman encountered Christ (John 4) at Jacob's Well. Evening optional Sound and Light Show at the Tower of David (additional $20). 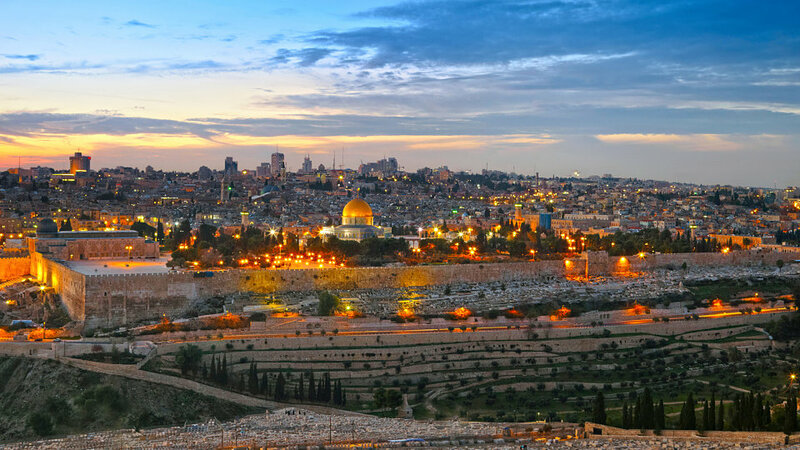 Stand on the Mount of Olives and enjoy a remarkable view of the Golden City of Jerusalem. Forty days after His resurrection, Jesus ascended into heaven from this place (Acts 1:9‐12). 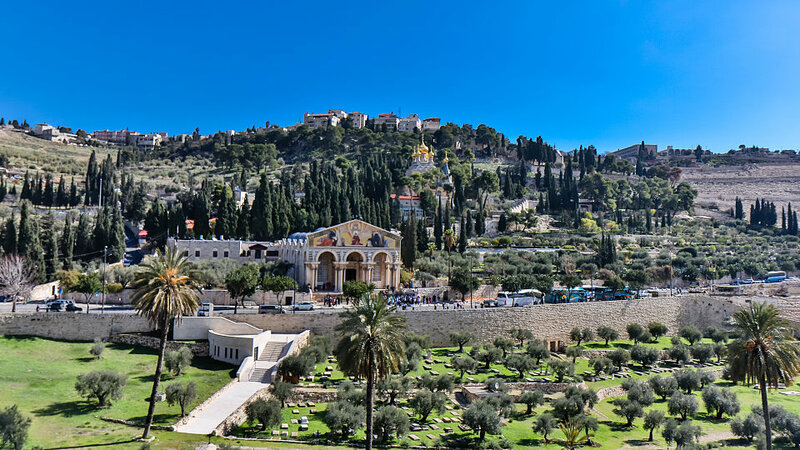 Walk to the Garden of Gethsemane and pray beneath the ancient olive trees (Matt.26:36‐44). On Mt. Zion, stand in the Upper Room, also known as the Cenacle, which is the traditional site of the Last Supper. Visit St. Peter’s Church in Gallicantu, built over the ruins of the House of Caiaphas, the high priest, where some say Jesus was questioned on the night of His betrayal. Optional traditional dinner in Jewish homes (additional $55). Walk the Cardo, the ancient main street of the Old City. Visit the Davidson Center where the Southern Wall Excavations of the ancient temple including the Southern Steps are. Explore ancient Jerusalem at the Teaching Steps and the Western Wall. View the Pool of Bethesda where Jesus performed the Sabbath miracle (John 5:1‐18). Visit Herod’s Antonia Fortress, where Jesus appeared before Pontius Pilate (Luke 23:1), and follow in Christ’s steps on the Via Dolorosa ("the Way of the Cross"). At the Church of the Holy Sepulchre, take time to reflect on His sacrificial love. Visit the Garden Tomb for a time of reflection and communion. Return home with memories to last a lifetime! Jan. 30 Cross the Allenby Bridge into Jordan. Visit Jerash. Overnight in Amman. Jan. 31 Visit Mt. Nebo & Madaba. Overnight in Petra or at the Dead Sea. Feb. 1 Explore Petra. Travel to the Dead Sea area for a late dinner and overnight. Feb. 2 Free Morning at the Dead Sea. Cross border back into Israel. Dinner in Jerusalem. Feb. 3 Return to USA.